Increasing levels of electronic waste, and its improper and unsafe treatment and disposal through open burning or in dumpsites, pose significant risks to the environment and human health. They also present several challenges to sustainable development, and to the achievement of the Sustainable Development Goals (SDGs). A better understanding and better data on e-waste will contribute towards the achievement of several goals of the 2030 Agenda for Sustainable Development. In particular, it will help address the SDGs related to environmental protection (Goals 6, 11, 12, and 14) and health (Goal 3). It will also address Goal 8 that focuses on employment and economic growth, since the sound management of e-waste can create new areas of employment and drive entrepreneurship. The growing amount of e-waste is the result of several trends. The global information society is growing at great speed. It is characterized by an increasing number of users and rapid technological advances that are driving innovation, efficiency, and social and economic development. By 2017, close to half the world’s population uses the internet and most people in the world have access to mobile networks and services. Many people own more than one information and communication technology (ICT) device, and replacement cycles for mobile phones and computers, and also for other devices and equipment, are becoming shorter. At the same time, disposable incomes in many developing countries are increasing and a growing global middle-class is able to spend more on electrical and electronic equipment, consequently generating more e-waste. Current trends suggest that the amount of e-waste generated will increase substantially over the next decades, and that better data to track these developments are needed. 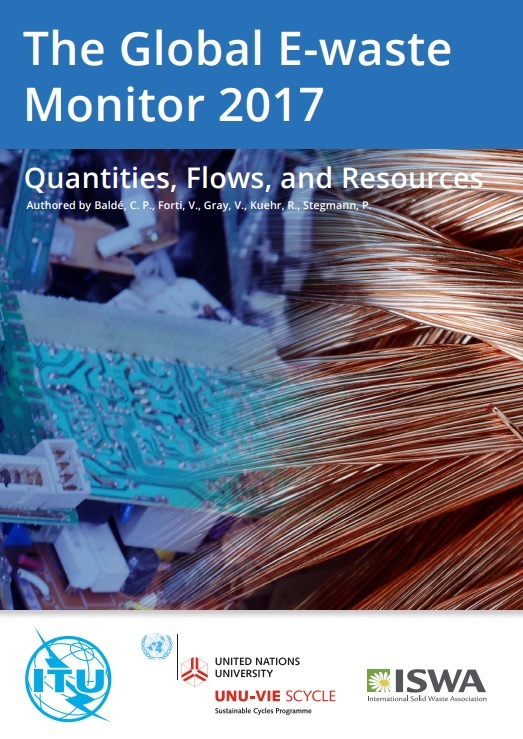 This report provides the most comprehensive overview of global e-waste statistics following the guidelines that were developed by the Partnership on Measuring ICT for Development1. All the countries in the world combined generated a staggering 44.7 million metric tonnes (Mt), or an equivalent of 6.1 kilogram per inhabitant (kg/inh), of e-waste annually in 2016, compared to the 5.8 kg/inh generated in 2014. This is close to 4,500 Eiffel Towers each year. The amount of e-waste is expected to increase to 52.2 million metric tonnes, or 6.8 kg/inh, by 2021.